This idea was brought to my attention the other day and thought it a great choice for a thread. Most of us who are US Navy fans can certainly recall the Navy's efforts to train their pilots on the Great Lakes (Lake Michigan) in the early 40's during the war. This thread may give you a nice idea of what that exersize was all about. Many interesting images to study here and quite possibly of interest to those who are involved with the restoration of aircraft that have been recovered from the Lakes. I have also included a page from my dad's logbook showing his 1st thru 8th carrier landings on the USS Wolverine in July 1944. Sources are the NMNA archives, Library of Congress photo archives, LIFE image archives. This will be a large photo thread in a few parts so we'll start with the two principal ships. WIKI: USS Sable (IX-81) was a training ship of the United States Navy during World War II. Originally built as the 'Greater Buffalo', a sidewheel excursion steamer, she was converted in 1942 to a freshwater aircraft carrier to be used on the Great Lakes. She was used for advanced training for naval aviators in carrier takeoffs and landings. One aviator that trained upon the Sable was future president George H. W. Bush. Following World War II, Sable was decommissioned on 7 November 1945. She was sold for scrapping on 7 July 1948 to the H.H. Buncher Company. The steamship 'Greater Buffalo' before it was converted to the USS Sable (IX-81). training aircraft carrier Sable (IX 81) moored alongside a pier on the shore of Lake Michigan during a break in training operations. WIKI: USS Wolverine (IX-64) a side-wheel excursion steamer built in 1913—was originally named 'Seeandbee', a name based upon her owners' company name, the Cleveland and Buffalo Transit Co. She was constructed by the American Ship Building Company of Wyandotte, Michigan. The Navy acquired the sidewheeler on 12 March 1942 and designated her an unclassified miscellaneous auxiliary, IX-64. She was purchased by the Navy in March 1942 and conversion to a training aircraft carrier began on 6 May 1942. The name Wolverine was approved on 2 August 1942 with the ship being commissioned on 12 August 1942. Intended to operate on Lake Michigan, IX-64 received its name because the state of Michigan is known as the Wolverine State. USS Wolverine (IX 64) commissioned as Great Lakes-based training carrier in August 1942. She was followed in May 1943 by USS Sable (IX 81). Last edited by Mark Allen M on Fri Mar 01, 2013 12:05 pm, edited 1 time in total. An F6F-5 makes an approach as a landing signal officer looks on aboard the USS Sable (IX-81). TBM Avenger takes a waveoff as another taxis on the flight deck of the training aircraft carrier Sable (IX 81) operating on Lake Michigan. Three FM-2 Wildcats pictured in flight over Lake Michigan while conducting carrier qualification on board the training aircraft carrier Sable (IX 81). aircraft carrier Sable (IX 81) showing a TBF hanging over the side after crashing during carrier qualifications on Lake Michigan. 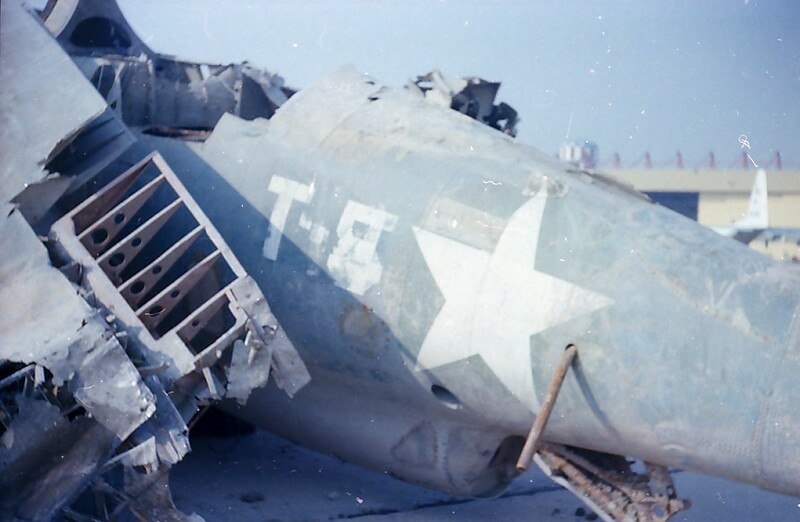 damaged FM-2 Wildcat on the flight deck of the training aircraft carrier Sable (IX 81) after it crashed during carrier qualifications on Lake Michigan. An SNJ-3C Texan has a mishap on the deck of the USS Wolverine (IX-64) while underway in Lake Michigan. An SNJ-3 Texan races along for takeoff on the flight deck of the USS Wolverine (IX-64) while underway in Lake Michigan. Dad's logbook showing his carrier landings on the USS Wolverine, NO mishaps!!! Once again Mark, great pictures. Thanks for sharing. I'd never heard of the TDN's before. Here's another picture I found of 2 TDN's on the Sable. You always deliver with some great photos. Here's dad on what is starting to look more and more like he could have been on the USS Wolverine at the time these photos were taken. BTW he was very tall (6-2) for a Navy pilot back then. Correction: I'm now to think this is dad at NAS Glenview, not on the Wolverine as all pilots were required to perform eight successful take-offs and landings and I believe the only way to have been out of the cockpit on the Lakes carriers was to have had a mishap of some sort. That's not for sure though. Last edited by Mark Allen M on Sat Mar 02, 2013 1:08 pm, edited 1 time in total. I like the way you have organized these! Thanks Mark. Can we tie any of the aircraft pictured into ones that have been recovered from the bottom of the lake? A few more Sable images. Chuck Wahl I'm going through my SBD photos for more as well. 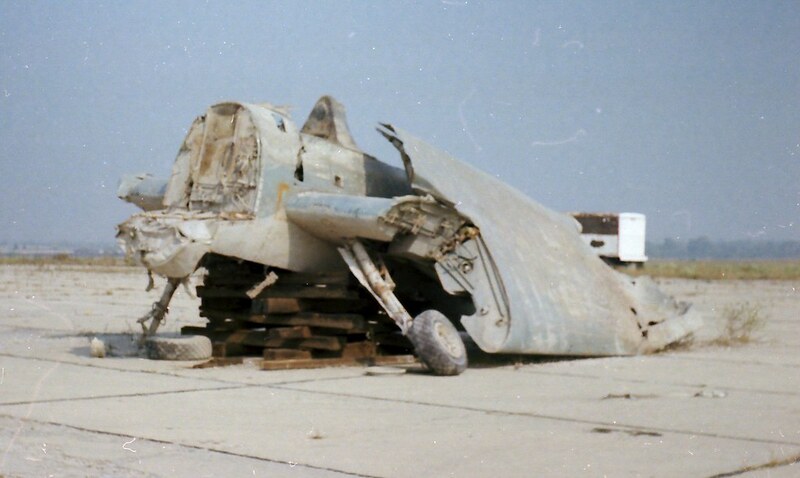 I've seen a few Sable SBD photos. USS Sable upbound on her delivery trip to Chicago Photo taken from the onboard the Joseph Wood upbound on Lake St. Clair in 1942. View of the Chicago, Illinois, skyline as seen from the deck of the training aircraft carrier Sable (IX 81) moored in Lake Michigan. LT C.V. Timberlake, a landing signal officer on board the training aircraft carrier Sable (IX 81), pictured in the cockpit of an SNJ Texan. Last edited by Mark Allen M on Fri Mar 01, 2013 3:51 pm, edited 1 time in total. A few more Wolverine images. Pilot crashes while attempting a landing on the USS Wolverine. The plane is an SNJ, the Navy version of the USAAF's T-6 trainer. SBD crashes into Lake Michigan after attempting a landing on the USS Wolverine. Last edited by Mark Allen M on Fri Mar 01, 2013 3:52 pm, edited 1 time in total. BuNo 05954, now with Harland Avezzie - I've never seen any other photos of this one. I took these after it was deposited on the ramp at NAS Glenview. Last edited by Chris Brame on Sun Jul 02, 2017 9:42 pm, edited 1 time in total. Looks like we already have a 'winner' ... See the two TBF photos of (T-5) in the water. Very cool.